001. Wow another weeks gone past. It really feels like times flying by this year, Its almost the end of February, I remember when I was younger and a week felt like a age, and a year felt like forever. I feel like times going so quickly I'm not able to keep up. Its scary to think that in two months Im going to be 20 years old. I feel like a old lady! But I also find it weird that I dont feel like I am in the place I imagined I'd be when I was older. I used to want to be a Dancer, and now I'm studying Graphic design? I thought id have my own place, but I live at home, I imagined being a beautiful tall lady, But feel the same as I did when I was 15, without the Emo hair! 002. I sent out all the zines from the competition this week, I'm so pleased to be getting some feedback on them all! Its currently up on Etsy (HERE) for about £2.50, Mainly to cover the cost of the postage/envelope and printing. Plus, Everyone who buys one of my zines gets their own personalized envelope & a little post-it with there name on. I wanted to add a personal touch to my things, and though the hand drawn type makes it extra special! Click HERE for an example of what I mean! 003. I finally got the Babooshka Boutique turban that I've been pining over for a while now. I'm wearing it today in my picture, But this one is different from my first one, But alas, I still like it. Its great though for hiding unwashed hair and also keeps your ears warm. JACKPOT. 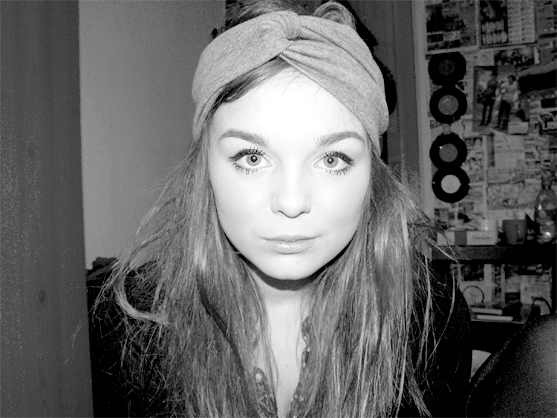 I feel very Mary-Kate Olsen in this though. All I need now is the Chanel half tint sunglasses! 004. What will I be doing this week? This week I plan on making a mini pattern zine, Just as a little extra for my own personal zine. Its going to be a pattern reference guide for myself I suppose. Ill be doing a few more inspiration images at some point this week too. I'm also planning on doing a photograph a hour thing, Which I first saw on Selena from Flying Saucers blog, I thought it was such as fun thing to do! For more examples of what I mean look here here. I'm working Tuesday-Wednesday, and getting my nails done Tuesday afternoon, Ill probably choose a day when I'm actually doing something interesting though. Maybe tomorrow? That photo an hour thing is a sick idea. Seems like she fair gets about! im dying over your eyes!